At 2012 SEMA I started seeing flat and matte in all colors, including pearls and metallics. These colors can be sprayed on or the car can be wrapped with vinyl. This video tutorial is going to demonstrate how to prep, mix, and spray a single stage matte black. Then I discovered a trick for a custom effect I will share with you as well. I also included a video discussing Matte Clear Coats. This video demonstrates how to prep an Aftermarket fender. 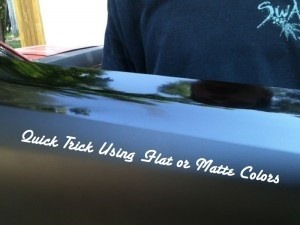 This video series is for spraying matte black, but the same steps can be followed for any color. One thing you want to be certain to do with aftermarket parts is to solvent test the part. If the test fails, you should strip the primer off and spray with epoxy or self etch to assure the metal has proper corrosion protection. If the test in the video above is performed and the primer is alright, then properly clean and prep the panel as described in the video. This video demonstrates how to apply primer sealer. I also have several spraying techniques that I am going to show you. Now you're ready to spray the mayye black. The brand I am using recmmends two coats of paint which makes the process fast and simple. A tip not mentioned on the directions is to add 10% of reducer to the second coat. This will help it lay down even. However, read the technical data sheet for the specific paint you are using. Here is a trick for you when using flat or matte colors. This is somehing I experimented with and can create custom results without spending more money. Matte and flat clears can also be applied to have the flat effect, which can be tri-coats or metallics. In this video I cover clears and talk about color matching. Thanks for visiting this tutorial. If you liked it, then please provide a Kudo on this page and share it with your online freinds.